In 1750,there were no factories: people worked at home, or in little workshops employing just a few people. One hundred years later, everything had changed, ans millions were working in factories. During this period the number of people living in Manchester increased by 20 times, and in Birmingham and Glasgow by nearly as much. The factories were noisy, dirty, dangerous, and life was very hard for the factory workers. Men, women and children had to to work for up to 18 hours a day,and many accidents occurred because people were so tired. It wasn't until 1817 that parliament passed a law limiting the working day to 10 hours for women and children. 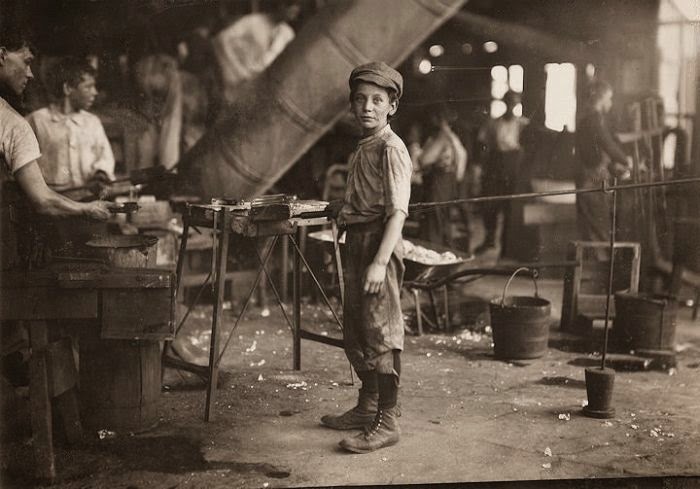 Children usually started work at the age of nine, and were harshly punished for not paying not attention to their work even for looking out of the window. It was not just a few unlucky children either. In many factories at this time at least half the workers were children, and at least half of the grown-ups were women; so there would not have been anyone at home to look after the children anyway. There were few schools. Children could go to evening classes, if they were able to stay awake, or to Sunday School, and that was all. Wages were very low and were often given partly in money and partly in tokens. These tokens could only be spent in factory shop or "Tommy shop" were prices were higher and quality was worse than in other shops. This was called the "Trunk system" , and although the Truck act was passed in 1831 to forbid it, the practice continued for some years because there was no one to enforce the law. Those could not get work had to starve, steal or go to the workhouse. Life in the workhouses was designed to be worse than anywhere else, so that no one would go there if they could possibly help it. Children were separated from their parents, and husbands from their wives. Prison uniforms were worn, the food was very poor, the work was very hard -stone breaking for example- and the inmates could only go out or have visitors with special permission. The factory worker was not much better off in his own home; it was certain to be dark and airless-there was a tax on windows- and badly built.The big towns and cities grew so quickly that whole families had to live in one room, and many people lived in cellars. There was no proper sanitation, water supply, or rubbish, and disease was so bad that in 1841 half the children in Liverpool died before age of 10. The people wanted Parliament to change things for the better; but only well-off people were allowed to vote, and the big towns had very few MPs. As a result the Chartist Movement grew up; it held great meeting all over the country, particularly in the North, and organised a huge petition asking for the reform of parliament. The Chartists also wanted the workhouses to be improved, and asked for the day to be limited to ten hours. The people also formed trade unions to try get higher wages and better working conditions, and gradually began to improve. Greetings to all! I really love your story! The newest technologies allow us to boost and deep our knowledge. Isn't that fantastic?